You might remember the talented Blaine Fontana from his Dunny designs Clouds and Patchwork in the LA Series. Now, the Portland based artist has released a new book from Zero+ Publishing called Amalgamate, as well as a super limited handcrafted Deluxe Box Set. 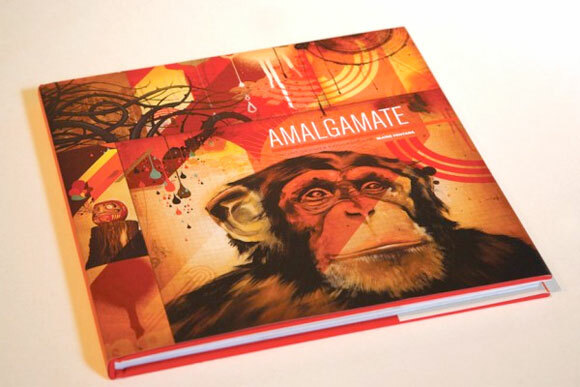 Amalgamate is Blaine’s second book and contains 108 inspiring pages of his unique style. Straddling the physical and metaphysical, organic and architectural, painterly and graphic sensibilities, Fontana fuses multiple visual strategies to forge an aesthetic language entirely of his own making. This visually pleasing 11 x 11-inch hardcover book has an edition of 1,000 copies and now available for $45. Weighing in at 14-pounds, the Deluxe Box Set is limited to only 10 pieces and contains 9 brilliant art collectibles: an embossed book signed & number, a hand finished 6-color silk screen print, his new Vannen Watch, six 6 x 8-inch postcards, a mini wood sculpture, a retired brush cast in resin box, 1 giclee, a certificate of authenticity, and a 25% off discount code to use for an entire year in Fontana Studios web store. The box is made out of reclaimed wood, and the cover is a CNC routed logo with a casted resin. Blaine himself painstakingly crafted 99% of this box with minimal outsourcing for the routed logo with some oiling and nailing done by his trusty apprentice. Not surprisingly, this $1,500 collector’s must-have is already sold out. Deluxe Edition Amalgamate Box Set Process from Blaine Fontana on Vimeo. AMALGAMATE:The Fine Art, Design, & Exploration of Blaine Fontana (A Brief Flip Through) from Blaine Fontana on Vimeo. 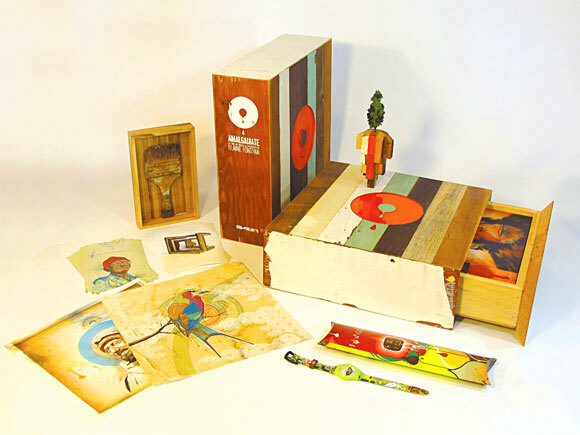 The post Amalgamate Art Book & Box Set By Blaine Fontana appeared first on Kidrobot Blog.